To help change the animal overpopulation issue, HHS hosts Fix Felix for Free event this month. Houston’s pet overpopulation problem isn’t new, and it isn’t going to be “fixed” overnight. Every local neighborhood fights the same battle: countless homeless pets dumped each and every day all around Houston, Texas communities. To truly win the war on pet overpopulation, it is imperative for pet owners to do their part, and it starts with spaying and neutering pets. In order to help in this matter, Houston Humane Society is hosting Fix Felix for Free on Wednesday, Feb. 17. Part of being a responsible pet owner includes making sure a pet is not part of the overpopulation problem. As an added bonus, studies show that altered pets live longer, healthier lives and are at a lower risk of developing certain types of cancer. Spaying or neutering pets can also have a positive impact on their behavior. It often reduces or eliminates unwanted actions such as marking territory, roaming, and aggression. Spaying and neutering is so important that Houston Humane Society has created an annual event called Fix Felix for Free to help local cat lovers neuter male cats for free. 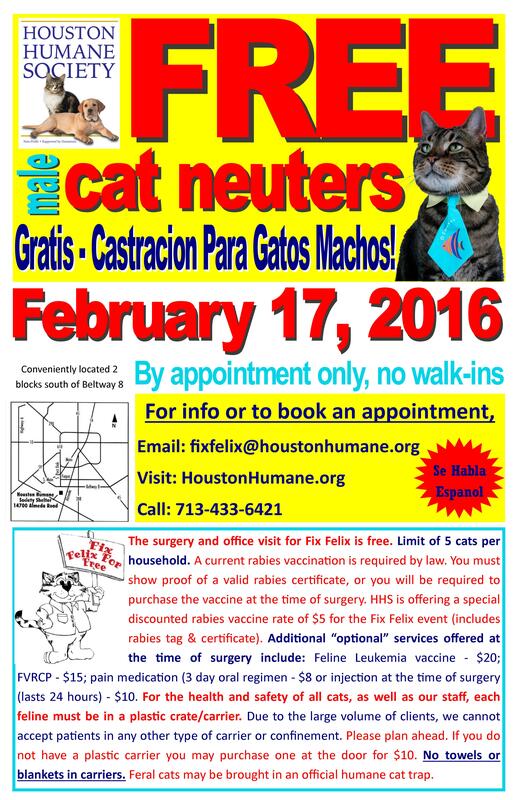 On Wednesday, Feb. 17, Houston Humane Society will neuter 700 male cats for no charge at the HHS Animal Wellness Clinic. It takes the entire HHS staff, many dedicated volunteers, and the staff of All Cats Veterinary Clinic coming together to make this event a success. It is a long, tiresome day of hard work that leaves staff and volunteers feeling rewarded for doing their part to combat pet overpopulation. Grateful cat owners can often be seen hugging and thanking staff for providing their pet with a quality surgery at a price anyone can afford, which is no charge at all. Cat owners must have an appointment, and there is a limit of five cats per person. Domesticated and feral cats qualify, and for the health and safety of all cats, as well as the HHS staff and volunteers, each feline must be in a plastic crate or carrier. A current rabies vaccination is required by law. Pet owners must show proof of current rabies certificate, or they may purchase a rabies vaccine for their cat the day of the event. Additional optional services offered at the time of surgery for a small fee. Pet owners can request an appointment by email to fixfelix(at)houstonhumane.org or by phone at 713-433-6421. To find out more information about Fix Felix for Free or low-cost spaying and neutering at Houston Humane Society, visit HoustonHumane.org. The Houston Humane Society is dedicated to, and working towards, ending cruelty, abuse and the overpopulation of animals while providing the highest quality of life to those in their care. The HHS does not receive any government funding or operating funds from national animal welfare organizations, and relies solely on donations, special events and program services. Visit the Houston Humane Society website for more information.